Mouth-watering prime rib is for special occasions, so why not serve it for Christmas dinner? You might think that a big hunk of mouthwatering roast beef is reserved for ordering in a restaurant. Not so! Prime rib is very easy to make and oh so impressive, not to mention incredibly tasty. This is the roast beef of your dreams; juicy, rare pieces in the middle and well-done pieces on the ends to give everyone what they want. If you don’t buy meat from the butcher very often, just ask for a standing rib roast. The butcher will know what you mean. Have the butcher remove the thick cap of fat and meat from the top and trim the external fat to about 1/2 inch. Pat the roast beef dry with paper towels. Combine the garlic, salt, and pepper in a small bowl to make a paste. Rub evenly all over the meat and place the meat in a shallow roasting pan, bone side down, fat side up. Let the meat come to room temperature, about 2 hours. Preheat the oven to 450 degrees. Roast for 15 minutes, and then turn the oven down to 350 degrees, without opening the door. Begin checking temperature after 60 minutes. The meat will roast for approximately 12 to 13 minutes per pound for rare meat. For perfectly juicy, rare roast beef, remove the meat from oven at 110 degrees. For medium rare, roast to an internal temperature of 115 to 117 degrees. A thermometer inserted deep into the flesh, but not touching bone, will give you a proper reading. When the meat reaches the desired temperature, remove it from the oven and cover loosely with foil. Let it sit at least 20 minutes, but not longer than 30 minutes. The meat will continue to cook (the internal temperature will rise 5 to 10 degrees) and the juices will redistribute, making the roast as juicy as can be. Do not skip this step. 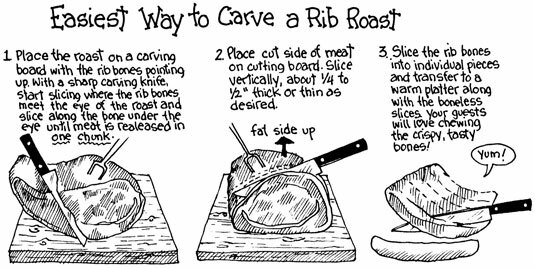 After the roast has rested, carve it by running a knife along the bones and down into the meat to release the bulk of the roast from the bone. Slice to serve and then cut down between the bones to serve them up to the die-hard carnivores. Per serving: Calories 537 (From Fat 324); Fat 36g (Saturated 15g); Cholesterol 148mg; Sodium 696mg; Carbohydrate 1g (Dietary Fiber 0g); Protein 50g. Let your rib roast rest before carving.